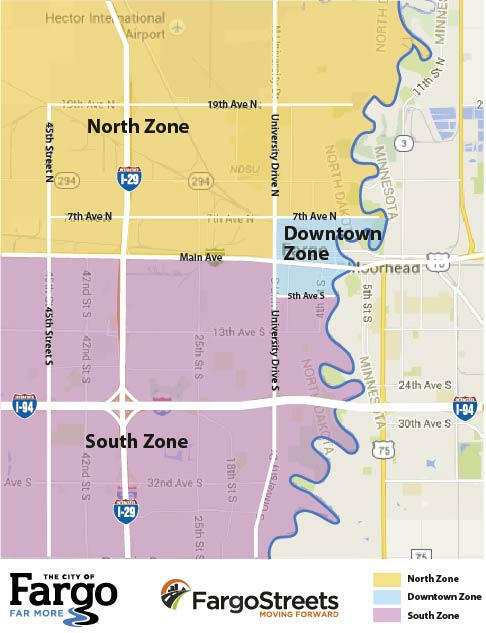 Next week contractors for City of Fargo 52nd Avenue South improvement project will begin the second phase of the roadway removals within the project limits in south Fargo. 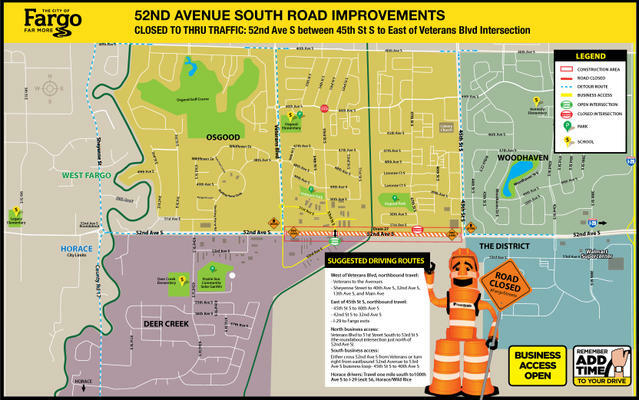 Starting Tuesday, April 2 after 9 a.m., 52nd Avenue will be fully closed to thru-traffic from east of the Veterans Boulevard intersection to the bridge work zone. The intersection of 53rd Street South and 53rd Avenue South will remain open to north and south traffic to cross the mainline of 52nd Avenue. Access to all north and south businesses along this stretch will remain open but it might be off other connections. One suggested route is to use Veterans Boulevard. Please be patient and call ahead if you need more direction to a specific location. Motorists are encouraged to add extra time to their travel plans through the area during peak hours (especially from 7:30 – 8 AM on Veterans Boulevard). Speeds are reduced near the school on Veterans Boulevard and an all way stop was added by city at 44th Avenue South and 53rd Street South intersection. The next 52nd Avenue closure will extend the work zone from west of the Veterans Blvd intersection to east of 63rd St S. Work is anticipated to begin in this phase in mid-June. Project phases anticipate the east side of the work zone over Drain 27 to open to one driving lane in each direction to 45th Street South intersection by mid-August. Both are weather and road condition permitting. The mile and a half stretch of 52nd Avenue South between 45th Street South and 63rd Street South improvement project will be spread over six-phases through October and completely reconstruct the rural two-lane roadway to an urban four-lane divided roadway with dedicated turn lanes. Over the course of this project, adjacent work zones may impact suggested driving routes. This summer project work will occur in City of West Fargo, Sheyenne Street Segment Three (32nd Avenue South to 40th Avenue South), City of Horace County Highway 17/76th Avenue South intersection and additional City of Fargo flood mitigation project will construct a box culvert south of 52nd Avenue South across 63rd Street South. **Please remember all schedules are tentative and weather dependent.